As with many species of birds and animals throughout the world, loss of habitat and competition from other more adaptive species and the general influence of Man on the fine balance of the natural world, is potentially putting them at risk of extinction. We therefore must consider it our duty to help protect them in any way we can. One such method is by ensuring the young from established pairs are kept safe during the very important and vulnerable stages of rearing. It was during a bush tour of New South Wales and Victoria, Australia, in the early 1990's, which was organised and directed by Ray Ackroyd, a licensed trapper, that he informed members of the Parrot Society UK, namely John Mollindinia and Tom Alston, whom were present on this particular tour, that one of the problems encountered by the Major Mitchell’s Cockatoos (Cacatua Leadbeateri), as it had been noted that not many were present, was the predation of active nesting sites by Goannas, a large monitor lizard, which would climb the tree trunk, enter the nest hole and steal the eggs or chicks, whichever happened to be present. Goannas are a species of Monitor Lizard, the particular trouble-maker being the Lace Monitor (Varanus Varius), which is the second largest of its group, growing to 2 metres in length and weighing as much as 20kg. They forage over long distances, covering up to 3 km a day feeding on insects, carrion, smaller reptiles, mammals and birds. Major Mitchell’s Cockatoos prefer lower nesting sites than other birds and particular types of trees known as Mallee trees (this refers to the way in which they grow rather than the species), which seldom grow more than 10 metres in height. This behaviour makes them more vulnerable to attack by ground dwellers that have the ability to climb. It was during this tour that Ray and John discussed what could be done to prevent the ‘raiding’ of the nesting sites by this method, thus helping the Major Mitchell’s survival rates. 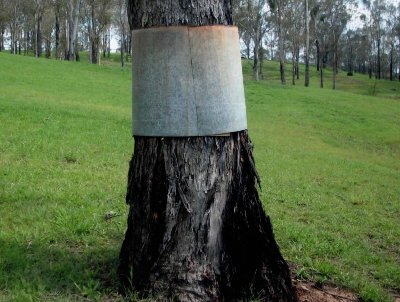 Ray came up with the idea of placing a sheet of tin around the tree trunk below the nest hole preventing the predator reaching the nest hole. Ray agreed to trial this idea in a certain area whilst monitoring the population, particularly young birds the following season. The results came back very encouraging, with the local population figures for the Major Mitchell's increased! Whilst Ray began his trial project, John returned to the UK and proposed to the Parrot Society UK Council, that if the results were good, that we should support Ray in his activities by covering the expenses incurred as Ray lives in the Blue Mountains, near Sydney, thus lots of travelling would be required to get to the areas where the Major Mitchell's nested and often in places that had no proper road access. The Parrot Society UK (PSUK) took up this mantle and supported Ray in his activities, with immediate results. 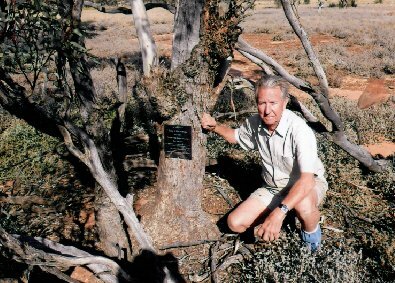 When John Mollindinia died in 2001, the PSUK not only elected to continue to support the project but honour John as the instigator to what can be considered a great success story, by placing a plaque on an active tree, a Curly Mallee (Eucalyptus gillii), within the Tandau farm located several hundred kilometres north of Sydney. 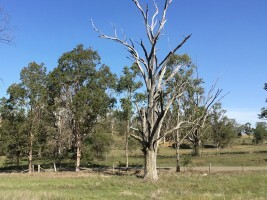 This tree is now maintained by the farm estate and still has an active pair of Major Mitchell's Cockatoos using it every season. It is estimated that since this particular tree or John’s Tree as it is more affectionately known, was tinned, over 30 chicks have been successfully raised in it. 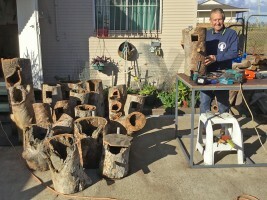 Following the initial idea by Ray and John, the PSUK now support Ray in the ‘Tinning’ of many trees, in our continued bid to maintain the population of the Major Mitchell’s Cockatoo. Since that time a new heavy duty flat plastic is now available and has proven to be an upgrade on tin. Also clear plastic does not stand out and makes it almost impossible for any person to identify the nest tree. The English Parrot Society (PSUK) is very proud of being able to fund a project to protect one of Australia's most outstanding Cockatoos. The fund has been ongoing for many years thanks to Mr Mollindinia. 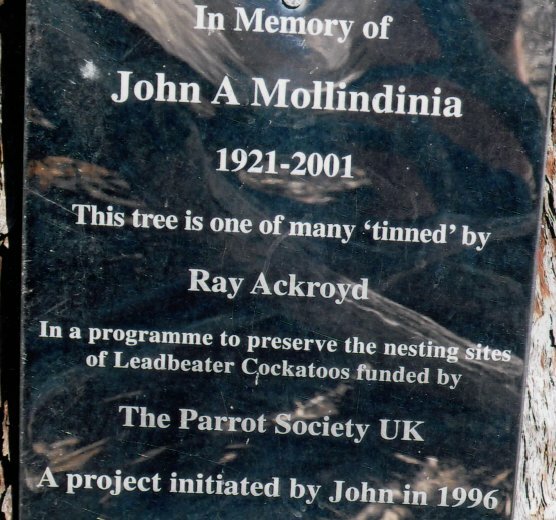 The Parrot Society attached a plaque at the base of a Major Mitchell's nesting tree in honour of the late John Mollindinia for his outstanding work. During the early part of 2013, the PSUK has learned that the South Australian government is actively supporting the conservation of rare Cockatoos, by offering land owners A$500 for every tree they tin which has been chosen as a nest site by the equally rare and challenged Red Tailed Black Cockatoo (Calyptorhynchus Banksii). In addition the State of Victoria has requested Ray to assist in a campaign to help promote the conservation of the Major Mitchell’s Cockatoo. This project has been awarded A$10,000 and will involve the assistance of school children reporting the location of an active nesting site of the rare cockatoos, for which they will receive A$100. 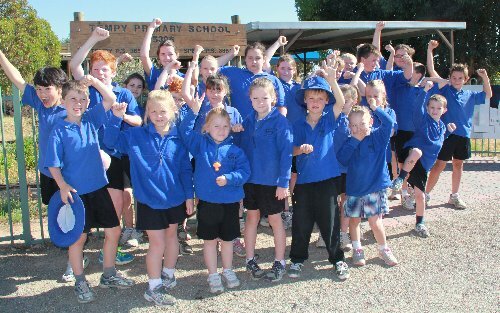 Tempy Primary School Children Celebrating the grant award, and who will be taking part in the spot and report a tree campaign, using Ray's guide for assistance. 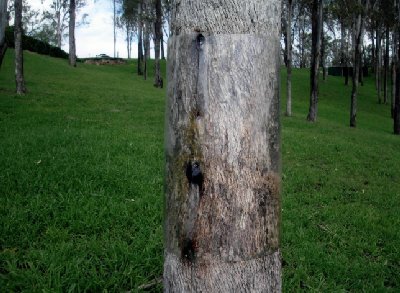 This unique procedure is also being adopted by other conservation groups to help other species whose nests are also being predated by Goannas, Feral Cats, foxes etc. 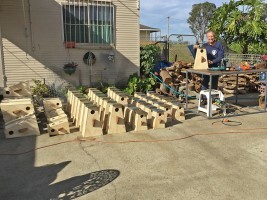 September 2018 update: Ongoing financial support from the Parrot Society's Conservation fund has allowed Ray Ackroyd to produce a batch of artificial nest boxes to increase potential cockatoo nesting sites. Following disastrous fires and prolonged drought in 2017 and 2018, many existing trees have disappeared. Ray tells us that the unusual (to British eyes) A-frame shape of the boxes is to reduce the amount of roof that exposed to the sun. An important consideration when temperatures regularly reach 40 degrees C or more! With these birds' breeding season fast approaching, Ray is working hard to get these boxes distributed and mounted. November 2018 Update: Ray reports that more than 50% of the nest boxes that have been sited and mounted are already occupied by Cockatoos and other parrot species, an excellent result! He says in a message to the Parrot Society that "No doubt with all the land clearing they were fairly desperate to get a nesting site. Thanks again to PSUK for allowing that to happen".